A highly non-linear solid core photonic crystal fiber (SCPCF) is designed in the present work. Three hexagonal air hole rings in cladding region and four very small air holes are present in a symmetric manner in the core region. By using full vectorial finite element method (FVFEM) with the perfectly matched layer, we study numerically the effective area of modal pattern as well as the nonlinear coefficient of this proposed SCPCF. 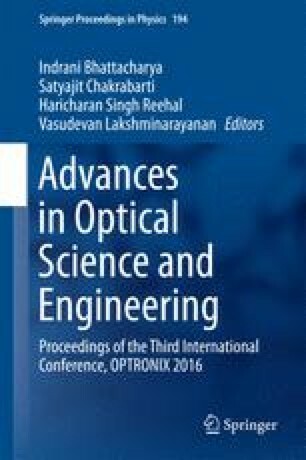 For this proposed fiber a small modal effective area 5.58 µm2 and a high nonlinear coefficient 21.38 W−1 km−1 are obtained at communication wavelength 1.55 µm for the small air holes in the core with diameter 0.15 µm. This type of SCPCF is useful for different nonlinear applications.